Warm and soothing hydro massage bath with Bio-Groom Shampoo and conditioner, exfoliating and cleansing facial wash, soothing blow dry, ears cleaned, nails clipped, haircut and choice of bandana or bows! Each pet also receives a spritz of aromatherapy spray, with a pleasant white tea and vanilla fragrance, or ginger root and grapefruit, or lavender and oatmeal calm. Each fragrance also contains a UV protector and helps revitalize the coats brilliance. Everything included in Grooming, excluding the haircut. Grooming and Bathing prices are quoted based on the breed, size, condition and demeanor of the pet. Please call for an estimate and understand that until we see your pet we can ONLY give an estimate. Small to medium size breeds are done in 4 to 4 1/2 hours. Larger breeds and families dropping off multiple pets will stay longer. Cats are usually completed in 4 to 5 hours. Please understand that we do our best to stay as close to these times as possible, but we hope you can understand that we are working on live and very unpredictable creatures and situations may arrise that can cause delays. Add fun playtime to your pets SPA day, let them romp and socialize. Recommended for DRY, ITCHY, and Flaky SKIN problems. We live in a very dry climate. As humans, we know when our skin is becoming dry, flaky or itchy, and that we need to moisturize. Our pets do not have the luxury of being able to moisturize on their own, nor can they tell us when they are feeling itchy. It is our responsibility as pet owners to pay attention to the behaviors of our pets to help us determine their needs. Not every pet with these symptoms can be cured by a hot oil treatment, but many can. Many of our existing clients have their pets treated with our ultra deep skin and coat conditioning hot oil treatment each and every visit, and they swear by it. In addition to relieving the itchiness and the flaky skin, it also gives a wonderful shine and ultra softness to the coat. Remove hair from your pet, not your couch. The thinking behind the FURminator deShedding Products is simple logic. The more hair you remove from your pet, the less hair you need to remove from your couch, your clothes, your floors, your carpet, your car and your home. But typical pet grooming products do not address the underlying problem, your pet’s undercoat. It’s not the hair you see. It’s the hair you don’t see. Your pet’s undercoat can become a dense mess of loose, dead hair, and the major source of shedding. The FURminator deShedding Products were developed to grab and remove undercoat hair quickly and easily, without cutting or damaging the coat. 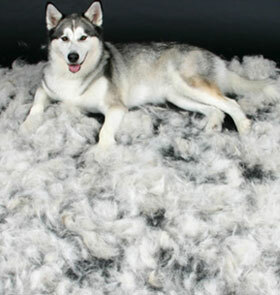 Your pet will enjoy the feeling the deShedding tool provides.